..... Click the link for more information. , although the name toad is sometimes restricted to members of the most terrestrial family of the Anura, the Bufonidae. ..... Click the link for more information. , hatch after 3 to 10 days; by the end of their first summer most frogs have completed their metamorphosis to the air-breathing, tailless, carnivorous adult. In some species, however, eggs are laid on land, and the young hatch as tiny frogs. In a handful of species the female gives birth to live young, either as tiny frogs or tadpoles. Growth to adult size usually takes several years. ..... Click the link for more information. , subphylum Vertebrata, class Amphibia. What does it mean when you dream about a frog? Frogs are associated closely with water, which makes them symbols of the unconscious. Because of the widely known story of the prince who was turned into a frog and then back into a prince, frogs also represent transformation. 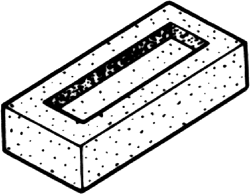 A hollow on one or both of the larger faces of a brick or block; reduces weight of the brick or block; may be filled with mortar. Also known as panel. A device which permits the train or tram wheels on one rail of a track to cross the rail of an intersecting track. The common name for a number of tailless amphibians in the order Anura; most have hindlegs adapted for jumping, scaleless skin, and large eyes. A relaxed free-fall position commonly used by sky divers. Old dream interpretation books say that frogs are good omens and represent happiness and great friendships. From a more modern point of view, frogs may be considered symbols of the unconscious because they live in the water. Frogs also represent transformation of the positive kind. fifth-grader Allison White scored the first face hit, dropping a frog squarely on the assistant principal's forehead. They have the usual frog jumping event, but add a frog race for variety. A shelf made by Willis' father is covered with tiny frogs, while the newest addition, a frog lamp, sits on her piano. Instead, the scientists found, a frog obtains these skin compounds by ingesting arthropods that contain them. Asked to think of an animal that can fly, most people don't picture a frog. A frog can sense a sound's direction from the way the two waves then interfere, because the exact interference pattern depends the angle between the frog and the sound source. While staring at a frog recovering from a surgical procedure last summer, microbiologist Michael Zasloff took a leap of thought that led to the discovery of a fastacting family of microbe-killing perptides.